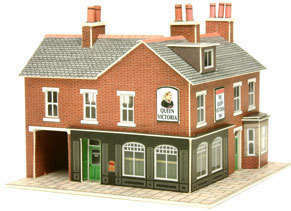 Recommended price £8.50 In this pack you get 2 brick built corner shops or Pubs. These can be combined with PN103 terraced houses. Each building can be either a shop or a pub, there are a lot of different signs and interiors. Back yards and paving are also included.